Healthy joints, bones and muscles helps you smile while walking, bending, reaching, carrying, running, dancing and even sleeping. Your body moves easily with healthy joints bones and muscles. A joint is a place where two bones meet. Your body has 206 bones and over 100 joints. Joints usually provide space for you to move. There are 3 types of joints, based on how their anatomy. 1. Some joints, called Fibrous Joints, are connected by fibrous tissue or collagen. 1.a. The joints in the skull, called Suture Joints, only allow movement early in childhood and become rigid as children grow. 1.b. A second subtype of Fibrous joint, the Gomphosis Joints, include joints between the teeth and the jaw bones and allow only a little movement. 1.c. A third subtype of Fibrous Joint, called the Syndemosis, exists between the two bones of the lower arm and the lower leg. These joints are moveable. 2. The Cartilaginous Joints have only cartilage between the joints. Healthy cartilage is more flexible than bone. For example, your ears are made of cartilage. Cartilage allows some movement. This illustration of a cartilaginous disk between 2 vertebrae also shows that cartilage is directly attached to the bones (called articular cartilage). 3a. Ball and socket joints include the shoulder-arm joint and the hip and femor leg bones. Here’s a picture of a ball and socket joint. 3b. Hinge joints include the joints in the fingers, toes and elbow joints. Here’s a picture of several hinge joints. 3c. Pivot joints include the forearm joint between the 2 bones, radius and ulna and between the two bones of the lower legs. This illustrates a pivot joint. 3d. Condyloid or ellipsoidal joints include the wrist joints where the radius (fore arm) joins the carpals and the knee joints, as shown. 3e. Saddle joints include in the joint of the lower thumb and the wrist metacarpals. 3f. Gliding joints joints include the joints between the tarsal joints of the foot and the carpals of the wrist. They allow a variety of movement. Healthy Cartilaginous and Synovial Joints help you smile as you walk, sit, run, squat, jump, kneel, dance, twist, bend, stretch, grasp, pick up, hold, lie down and get up. A firm, gelatinous substance called cartilage cushions the ends of the bones in the joints. Articular cartilage covers the ends of the bones like upholstery fabric on a chair. You may have seen cartilage at the end of chicken leg bones. Healthy cartilage has a smooth, slippery surface that allows two bones to glide easily in motion. Because of the impact sustained by articular cartilage, there are no blood vessels in the cartilage to deliver moisture and its food, nor to remove its wastes. Instead, the cartilage receives its nourishment from fluid present around the joint. 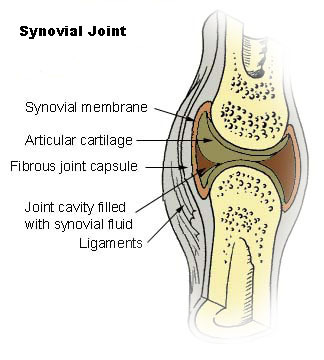 Synovial joint shows the capsule, Synovial membrane, articular cartilage, bones, and space filled with Synovial fluid. The joint capsule is lined with a several layers of cells forming a synovial membrane or synovium (view Synovial joint illustration). This membrane is made up of synovial cells. The synovial cells produce synovial fluid. Healthy Synovial fluid is a clear fluid with an egg-like consistency, hence the name Synovial (means egg-like). This fluid fills any microcavities, and forms a thin layer between the surfaces of the articular cartilage, and fills the articular cartilage (like a wet sponge). Synovial cells secrete hyaluronan and lubricin into the Synovial fluid. Hyaluronan (hyaluronic acid) increases the viscosity of the articular cartilage so it’s dense. Hyaluronan also increases the elasticity of the articular cartilage so that it can easily be compressed and bounce back to its original thickness. Lubricin reduces friction during motion by the articular cartilage surfaces on the 2 moving bones (also called boundary layer lubrication). Lubricin appears to also help regulate growth of Synovial cells. When you’re resting and not moving the joint, your cartilage absorbs nourishment from the surrounding synovial fluid. Your joint also releases its wastes into the joint fluid. The synovial fluid is constantly being replaced—providing more nutrients and removing wastes. Some physicians compare joint cartilage to a very dense car sponge. Exchange of the liquid in the dense sponge with the surrounding fluid is slow without any movement. Weight-bearing exercise compresses or squeezes your cartilage of the relevant joints. The compressed or squeezed cartilage oozes out some of its fluid containing wastes. When you release the pressure, the joint soaks up fresh fluid. Several habits help keep cartilage, joints, bones and muscles healthy. First, exercise helps speed the exchange of used fluid in cartilage with nutrient- rich synovial fluid. It also helps build bone density and muscle strength. Exercise helps keep your joints, bones and muscles healthy. Second, it’s also important to drink sufficient water and have sufficient trace minerals to maintain healthy hydration of your cartilage, joints, bones and muscles. Third, cartilage and bones need certain nutrients or building blocks to stay healthy. Eating foods that deliver sufficient nutrients help maintain healthy joints, bones and muscles. I’ll be adding this webpage shortly so please stop by again. Please note that the information on this website is a sharing of information and knowledge from the research and experience of Dr. Molnar-Kimber and her community. It is not intended to diagnose nor treat any disease or precondition nor replace your one on one relationship with a qualified health care professional. It also is not intended to be medical advice. However, it is often observed that patients who take a major interest in their disease and learn as much as they can about their disease and potential treatments often improve faster than those who don’t. Dr. Molnar-Kimber encourages you to make your own health care decisions based upon your own research and discussions with your qualified health care professional. 2006-2010 © Katherine L. Molnar-Kimber, Ph.D.